A Bench comprising of Justice KS Radhakrishnan and Justice Pinaki Chandra Ghose today banned Tamil Nadu's centuries-old Jallikattu bull fights. The petitions were brought forth by Animal Welfare Board of India (AWBI) and PETA. The Court applied the standard of “Species Best interest” subject to the exceptions arising out of “necessity” as carved out under Section 11(3) of the PCA Act. The Bench concerned itself with the issue of seminal importance with regard to the Rights of Animals under the Constitution, laws, culture, tradition, religion and ethology, which had to be examined in connection with Jallikattu, bullock cart races, etc in the States of Tamil Nadu and Maharashtra. This had to done with particular reference to the provisions of Prevention of Cruelty to Animals Act, 1960, the Tamil Nadu regulation of Jallikattu Act, 2009 and the notification dated dated 11.7.2011 issued by the Central Government under Section 22(ii) of the PCA Act. AWBI, as represented by Shri Raj Panjwani, highlighted the manner in which Jallikattu is conducted, especially in the Southern Part of the State of Tamil Nadu, and how the bulls involved are physically and mentally tortured for human pleasure and enjoyment. It took the stand that any historical, cultural or religious significance attributed to Jallikattu would be superseded by the PCA Act, it being a Parliamentary legislation. Advocating the validity of the notification dated 11.7.2011, which banned the exhibition of Bulls or training them as performing animals, it claimed that TNRJ Act is repugnant to the PCA Act and the rules made in furtherance of the Act. This submission was accepted by the Court. Acts of cruelty on the bulls during these races, as submitted by the AWBI in its three reports, included ear cutting/mutilation, fracture, dislocation of tail bones, frequent defecation, urination, injuries leading to death, biting or twisting a bull’s tail, poking bulls with knives and sticks, using irritants, using nose ropes, cramped conditions, spectators beating and agitating bulls, restraining, roping and other cruelties meted out to the bulls within the arena including mental torture. The Court had to decide in the light of these facts whether the events conducted in Tamil Nadu and Maharashtra are in violation of PCA Act and the Constitution of India. The organizers of Jallikattu and Bullock-cart races, represented by Shri Bali, submitted that these races are closely associated with village custom and tradition and denied any cruelty towards the animals. According to them, it won’t be in public interest to ban the entire event in the State of Tamil Nadu, merely on account of some violation of regulations. The Court here referred to the Statement of Objects and Reasons of the TNRJ Act and noted the absence of any religious significance. PCA Act, being welfare legislation, overrides the so-called tradition and culture. 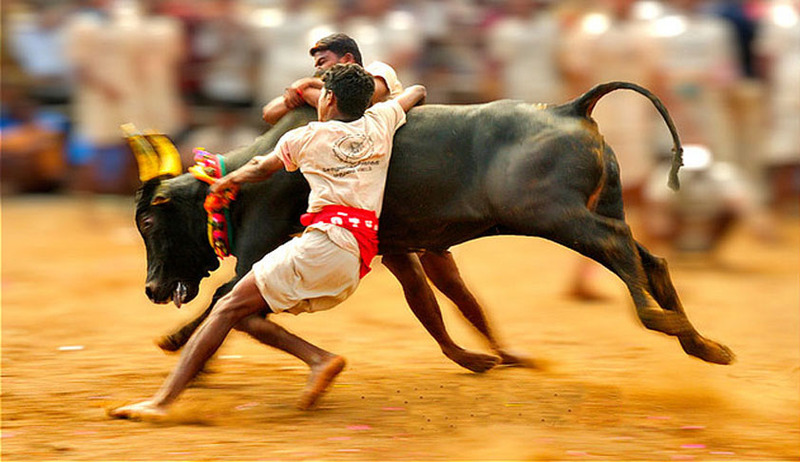 It was claimed by the State of Tamil Nadu, as represented by Shri Rakesh Dwiwedi, that Bulls are “performing animals” since there is no sale of tickets in the events. This submission was dismissed by the Court as having no substance, when bull is specifically prohibited to be exhibited or trained for performance. The Government, through MoEF proposed to exempt bull participating in Jallikattu in the State of Tamil Nadu from the purview of the Notification dated 11.07.2011, in order to strike a balance and to safeguard the interest of all stakeholders, including animals, and keeping in mind the historical, cultural and religious significance of the event. However, the Court held that the Government can’t take a contrary view now, that too, without consulting the AWBI, whose advice was already accepted and acted upon. It was submitted by the counsel for the State that events like Jallikattu, which do not cause that much of pain or suffering on the animal, cannot be completely prohibited, but could only by regulated. The Court ruled that the words “or otherwise” covers all situations of pain and suffering. The Court said that Sections 3 and 11 of the PCA Act, which confer duties, responsibilities and obligations on the organizers as well as corresponding rights on the animals, have to be read in consonance with Article 51A(g) of the Constitution of India which cast fundamental duties on every citizen to have “compassion for living creatures”. “Life” for animals was recognized to include the right to live in a healthy and clean atmosphere and right to get protection from human beings against inflicting unnecessary pain or suffering as guaranteed to the animals under the aforestated provisions. According to the Court, by forcing the bull into the vadi vassal and then into the arena, by no stretch of imagination, can be said to be “for the wellbeing of such animal”, but for the pleasure and enjoyment of human beings and causes them pain and injury. Organizers of Jallikattu are depriving the rights guaranteed to the bulls under Section 3 of PCA Act. Hence, section 3 of PCA Act is violated. The Court further categorized bulls as not being performing animals, anatomically not designed for that, but are forced to perform, inflicting pain and suffering, in total violation of Sections 3 and Section 11(1) of PCA Act. Referring to the Performing Animals (Registration) Rules, 2001, the Court said that bulls are trained to perform in fear and distress and hence their natural instinct is being exploited. The Court observed the absence of any International agreement on this issue and observed that “international community should hang their head in shame, for not recognizing their rights all these ages, a species which served the humanity from the time of Adam and Eve.” It recognized the five freedoms set out in the Universal Declaration of Animal Welfare (UDAW), campaign led by World Society for the Protection of Animals (WSPA) which have found support in the PCA Act. These include freedom from hunger, thirst and malnutrition; freedom from fear and distress; freedom from physical and thermal discomfort; freedom from pain, injury and disease; and freedom to express normal patterns of behavior. World Health Organization of Animal Health (OIE) has been recognized by the Court as an international reference organization for animal health and animal welfare. The rights of animals were also considered in the light of Article 19(1)(f) of the Constitution which now makes right to property a legal right, animals being considered a form of property. It observed that the rights guaranteed to the animals under Sections 3, 11, etc. are only statutory rights. The same have to be elevated to the status of fundamental rights. Principles of compassion, humanism and speciesism have to be borne in mind while enforcing Article 51A(g)(h) of the Constitution, which is the magna carta of animal rights. (1) We declare that the rights guaranteed to the Bulls under Sections 3 and 11 of PCA Act read with Articles 51A(g) & (h) are cannot be taken away or curtailed, except under Sections 11(3) and 28 of PCA Act. (2) We declare that the five freedoms, referred to earlier beread into Sections 3 and 11 of PCA Act, be protected and safeguarded by the States, Central Government, Union Territories (in short “Governments”), MoEF and AWBI. (3) AWBI and Governments are directed to take appropriate steps to see that the persons-in-charge or care of animals, take reasonable measures to ensure the well-being of animals. (4) AWBI and Governments are directed to take steps to prevent the infliction of unnecessary pain or suffering on the animals, since their rights have been statutorily protected under Sections 3 and 11 of PCA Act. (5) AWBI is also directed to ensure that the provisions of Section 11(1)(m)(ii) scrupulously followed, meaning thereby, that the person-in-charge or care of the animal shall not incite any animal to fight against a human being or another animal. (6) AWBI and the Governments would also see that even in cases where Section 11(3) is involved, the animals be not put to unnecessary pain and suffering and adequate and scientific methods be adopted to achieve the same. (7) AWBI and the Governments should take steps to impart education in relation to human treatment of animals in accordance with Section 9(k) inculcating the spirit of Articles 51A(g) & (h) of the Constitution. (8) Parliament is expected to make proper amendment of the PCA Act to provide an effective deterrent to achieve the object and purpose of the Act and for violation of Section 11, adequate penalties and punishments should be imposed. (9) Parliament, it is expected, would elevate rights of animals to that of constitutional rights, as done by many of the countries around the world, so as to protect their dignity and honour. (10) The Governments would see that if the provisions of the PCA Act and the declarations and the directions issued by this Court are not properly and effectively complied with, disciplinary action be taken against the erring officials so that the purpose and object of PCA Act could be achieved. (11) TNRJ Act is found repugnant to PCA Act, which is a welfare legislation, hence held constitutionally void, being violative or Article 254(1) of the Constitution of India. (12) AWBI is directed to take effective and speedy steps to implement the provisions of PCA Act in consultation with SPCA and make periodical reports to the Governments and if any violation is noticed, the Governments should take steps to remedy the same, including appropriate follow-up action. This judgment is being celebrated as a landmark judgment by animal rights activists throughout the country. The judgment can be read here.